Tools I used for marking my 2014 WA state mail in ballot: Hard Surface (Clipboard), Ball Point Pen, Small Metal Ruler and the Internet. Note that there are no soft drinks, food, or blood anywhere near my ballot. Note that I tore off the stub (upper left) and tested my ball point on it before using my small metal ruler to draw straight lines on my ballot placed on the hard clipboard surface. Marking Your Ballot So That a Sequoia 400 Optical Scanner Doesn't Spit It Out. Even for those of us who pay attention to politics and the electoral process, understanding and completing our ballot is a problematic exercise that requires time, attention to detail and and thoughtfulness. Many, many people who turn in their ballot do not mark the full ballot. This creates a well known and predictable result call "falloff" where the candidates and issues placed first on your ballot receive more participation per voter than those placed later. Because of this,WA state actually legislates the order on your ballot to assure greater participation for state issues. Here's a look at my final matchback statistics for the 2014 Primary, although I heard that the actual total for late ballots ended up being near 500! What you are not seeing in these numbers are internal statistics for those ballots that needed a bipartisan panel adjudication process to determine 'intent'. Please: Don't double mark any issue or candidate but the Charter Review Commission (maximum 5). For all other issues and candidates, select one only. If you are more interested in the process, King County has an excellent guide "The Life Cycle of Your Ballot" . The Secretary of State of WA has a manual: "What is a Vote?" to help counties to adjudicate voter intent on poorly marked ballots. You can also call our email Whatcom County Electons for more information. 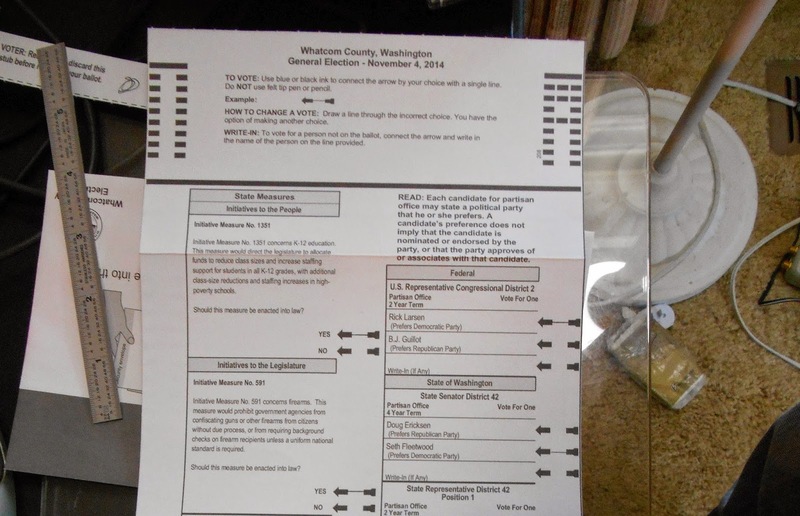 In general, I mark my ballot based on Democrat recommendations for candidates, FUSE WA recommendation for Judicial and Congressional districts and use Riley Sweeney and the recorded debates to understand other candidates. Unless I'm really pissed off by some set of candidates or issues, I fill out the whole ballot. If just one candidate is running, that lucky individual generally gets my vote by default. My reasoning is pretty simple: if no one else is running somebody has got to do that job. What can I say about this? The lone candidate on the ballot may not necessarily represent my particular viewpoints, but at least they decided to run when no one else would. As the tea partiers sometimes say: "Just Show Up". If I can paraphrase: "Just Fill out Your Ballot". Because I download and parse PDC funding data, sometimes I cast what would probably be seen as a contrarian vote by many people who vote straight Democrat or Liberal. This year I am greatly disturbed by the $3M dollars from New York flowing into I594. Gun violence is a serious and disturbing problem. But we have good reasons for living with the benefits and costs of the first ten amendments and I think there are important philosophical reasons why our founding fathers wanted us armed. Despite such constitutional leanings, I do not believe in either libertarian or anarchist dogma. I think government is important. I think rules and laws are important. I think individual electoral participation that decides what those rules and laws are is the most important piece of all. And that's why I make such a darned big deal out of voting. I hope you do too!! PLEASE VOTE! !